Dumbo, which celebrates its 70th anniversary today, was Walt Disney Studio's fourth animated feature and its first to be based on something other than a traditional fairy tale, folk story or fable. Although Walt Disney's debut picture, Snow White and the Seven Dwarfs, was a huge critical and commercial success, his following two films (the wonderful Pinocchio and the boldly experimental yet wildly uneven Fantasia) were unfortunately box office failures. Consequently, Dumbo — with its simpler animation, less ambitious storytelling and truncated length (at 67 minutes, one of Disney's shortest features) — was primarily an attempt to recoup much of the money lost on the company's two preceding efforts. While it is not perhaps the masterpiece that Pinocchio may be, it is deservedly a classic. It is a charming and heartwarming little parable told with sincerity, humor and a surprising amount of emotion, as corny as that may sound. I watched it often as a kid, and I have to confess that upon revisiting it recently, I was genuinely surprised by how moving it still is. The story for Dumbo has perhaps the most unique origin of any Disney film. It began as a children's story, written by Helen Aberson and illustrated by Harold Pearl for something called a "Roll-A-Book." While I've personally never even heard of this item before now, a little Internet research reveals that it was a novelty toy, similar to a panorama, composed of only eight drawings and a few lines of text. Apparently Disney first discovered this children's trinket in 1939 and initially intended it to be a short film, though he eventually expanded it to feature length. Given its somewhat inauspicious beginnings, it's no surprise that Dumbo's story is simple, but it is nonetheless an effective one. In a nameless traveling circus, a maternally inclined elephant named Mrs. Jumbo receives a special delivery from the stork (amusingly voiced by a pre-Winnie the Pooh Sterling Holloway): a baby son whom she calls "Jumbo, Jr." Although he is first fawned over by the other elephants, once it is learned that the little guy has abnormally large ears, he's immediately labeled a "freak" and treated rather cruelly, given the derisive moniker of "Dumbo." Naturally, his mother is the only one who loves and cares for him, but when she tries to protect him from a group of nasty teenagers, giving a much-needed spanking to one in particular, she's considered dangerous and is consequently ripped away from Dumbo and locked up. Things look pretty bleak for Dumbo, but with the help of a loyal circus mouse named Timothy and a group of sympathetic crows, Dumbo soon discovers a rather singular hidden talent: he can fly. His enormous ears, which previously had been the cause of his misery, become the secret to his success, or as Timothy aptly puts it, "The very things that held you down are gonna carry you up and up and up!" Dumbo subsequently wows audiences, captivates the world, reaps fame and fortune, gains acceptance, wins the release of his mother and is reunited with her for a joyous happy ending. Confession time: although I watched Dumbo frequently in my youth (along with just about every other Disney movie), it was never one of my favorites. I enjoyed it well enough — especially the character of Timothy, with his thick Brooklyn accent and powerful sense of justice (seriously, with a friend like him, you don't need any more friends) — but the whole thing just seemed very light to me at the time. Watching it now I can see why I might have thought that. Naturally the animation is lovely, but in an attempt to keep costs down so the film could turn a profit, it's done in a far simpler, less detailed fashion than Disney's usual output from that period; indeed, at times it almost resembles a Fleischer cartoon more than a Disney. The backgrounds, though bright and colorful, are rendered in watercolors. Also, one of the most interesting characteristics of the film, which I can fully appreciate now, was one that I didn't care for when as a kid — namely, that the film's protagonist never speaks. 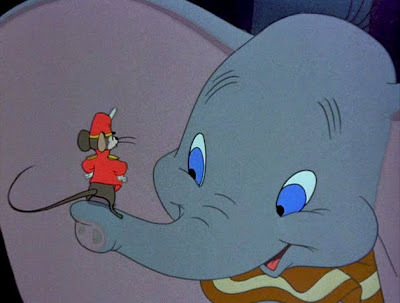 Although Disney is iconic for anthropomorphizing animals in films such as Pinocchio, Bambi and even this one (interesting that all the other elephants have lots of dialogue), Dumbo's two main characters never speak. Except for a brief moment where Mrs. Jumbo tells the stork the intended name of her new arrival, Dumbo and his mom always look, sound and more or less act like real elephants, and I just wasn't as impressed by that as a youngster as I am now. In fact, all of the scenes between mother and son, which kind of bored me as a boy, now are the most emotionally resonant scenes in the picture. There's an amusing reference to "The Little Engine That Could" early on in the film when the circus train tries desperately to make it over a steep hill, the whole time chanting "I think I can, I think I can." The first glimpse of Dumbo has to be just about the cutest thing I've ever seen on film. 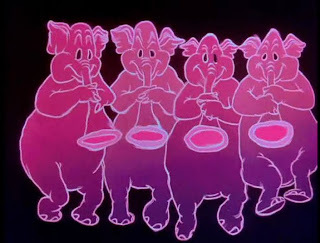 The animators wisely modeled the movements of the baby elephant after that of a newborn human child. Mrs. Jumbo's normally blue eyes turning red when she defends her son is a subtlety I don't think I ever picked up on before. Timothy's claim that "Lots of people with big ears are famous" is clearly a reference to Disney himself. The clown act, which always was my favorite sequence as a kid, now seems too broad and silly to be funny. 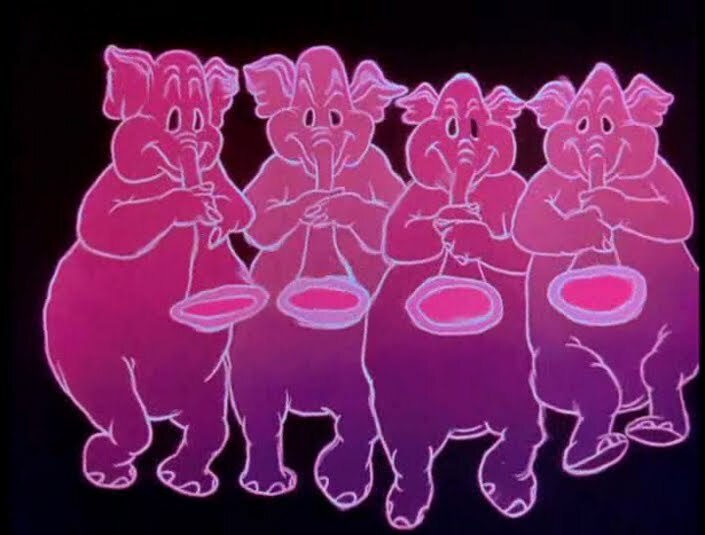 Along with the "Heffalump and Woozle" nightmare from Winnie the Pooh, which it very much resembles, the pink elephant number spooked me as a kid. Looking at it now, it just seems like a strange and almost out of place sequence that features some stunning and delightfully surreal animation. Without IMDb, I never would have figured out that the leader of the crows (unwisely named "Jim") was voiced by Cliff Edwards, a.k.a. Jiminy Cricket. However, I think I might've known, on some kind of deeper instinctual level, that the "leader" of the other female elephants was Verna Felton, a.k.a. the Queen of Hearts. 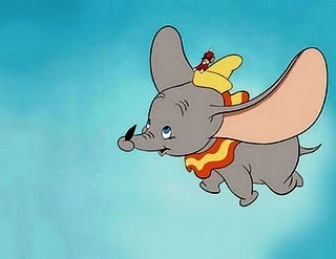 I love the gag where Dumbo, having flown for the first time, lands on the telephone wires, and as far off as the eye can see, the poles buckle under his weight. The climax where Dumbo loses the "magic feather" while falling and Timothy pleads with him to open his ears to fly on his own is just as suspenseful and inspiring a moment as when Luke's about to destroy the Death Star at the conclusion of Star Wars. Excellent look at this one, Damian. 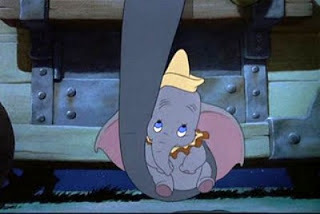 DUMBO, among all of the early Disney animation pieces, is still the one that gets to me the most emotionally. That mother and child scene (the one you pictured)... man. Anyway, fine article. Thanks. What a coincidence -- I was at the dentist this week and the only thing they had to read in the waiting room was the kid's book version of Dumbo, which I dutifully read. I haven't seen the movie though in 40+ years -- might have to track it down now. Thanks for the compliment. Interesting observation about that scene with Dumbo and his mother when she's locked up. The DVD subtitles indicate that the song "Baby Mine" is actually sung by her. I never interpreted it that way and I'm not sure I buy it. I mean, I realize that the lyrics of the song are written from her point of view (i.e. it's the kind of song she could/would sing to her son), but I don't think she literally sings it in the film. I think the song (like "Casey, Jr.") has no source, it's just part of the score at that point. Furthermore, we never actually see her sing it. You should watch it again. You might be surprised. 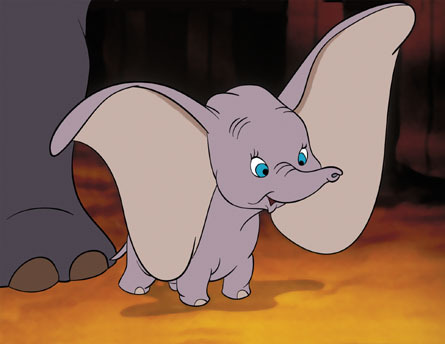 Dumbo is amazing! Also, I found out why he has such big ears! His dad, Mr. Jumbo, was an African Elephant.